Gum disease is caused by plaque, the film of bacteria that builds up on the teeth. The bacteria digest the food and drink that you consume and produce toxins which irritate the gums. Your body, detecting the irritation, sends more blood to the area and that is why gums may become red and swollen and bleed during brushing. This is known as gingivitis and, if left untreated, can lead to periodontal disease. This is where the bone supporting the teeth weakens and gradually disappears, so the teeth can become loose and may eventually fall out. Receding gums may be caused by overly aggressive brushing, but could also result from infection hidden below the gum line, so it’s important to seek advice from your dentist. 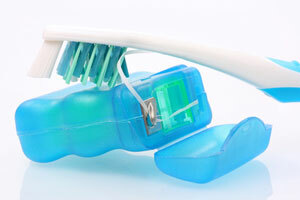 The key to preventing gum disease is cleaning your teeth thoroughly at least twice a day. Brushing for four to five minutes and using dental floss will remove most of the plaque. This may seem like a long time, but people who do take the time rarely have gum problems. The better you clean your teeth, the healthier your gums will be. It’s also important to have your teeth scaled and polished by your dentist. They will be able to remove plaque from areas you can’t easily reach, and more importantly, point out areas that need more attention during brushing.